The May 2 earnings report will be a great chance to check how things are going for the e-commerce platform company. Rapidly growing e-commerce platform company Shopify (NYSE:SHOP) is set to report first-quarter earnings on Tuesday, May 2, before the market opens. 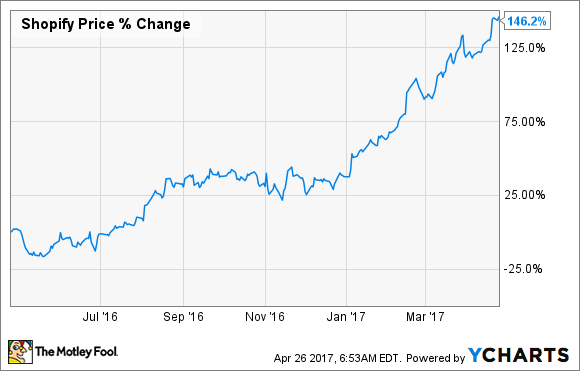 The company has been on a growth tear, and the stock has followed suit, up 146% in the past year. Shopify's 86% year-over-year revenue growth in the fourth quarter has created high expectations for the company's first quarter. The following chart shows three years of quarterly revenue for the two reporting categories. Subscription solutions: Revenue from monthly subscription fees that merchants pay to be on the Shopify platform. Merchant solutions: Revenue from a small portion of each sale merchants make. Image source: author; data from Shopify's earnings reports. There are five areas where the company needs to succeed so that it can continue to drive revenue growth and eventually profitability. Read on for the five questions I'll be watching for Shopify management to answer when the company reports earnings. 1. Is Shopify continuing to attract new merchants? Shopify wouldn't exist without the owners of small and medium-sized businesses who want to take advantage of the power of e-commerce to sell products online. Shopify has come a long way from when founder Tobi Lutke opened the first e-commerce business on the Shopify platform to sell snowboards in 2004. Shopify reported having 377,500 merchants on the platform as of the end of 2016, up from 80,000 three years prior. While year-over-year percentage growth has been decreasing, the number of merchants being added is still significant. Last year, Shopify added an average of 33,625 merchants each quarter. I'll be watching to see if Shopify can beat this number in Q1. But just adding merchants won't ensure long-term growth for the company: Shopify wants these merchants to successfully grow their online businesses, too. 2. Are merchants selling more? If Shopify's merchants are selling more product over time, that's proof that the platform is an effective tool. Every quarter, Shopify reports gross merchandise volume, which is the total dollar value of orders processed on the Shopify platform, and investors can easily figure out a per-merchant value, the red line in the chart below. Shopify's merchants sold an average of $14,570 worth of merchandise last quarter, a 26% increase from the previous year. I'll be watching to see if this trend continues. Once entrepreneurs are able to grow their online business with an entry-level subscription plan, Shopify provides a more comprehensive plan for the growing business at an additional cost. 3. Are merchants paying more to use the platform? Shopify has monthly pricing plans ranging from Shopify Lite at $9 a month to Shopify Advanced at $299 a month, and for corporate and large businesses, there's Shopify Plus at $2,000 a month. The company reports monthly recurring revenue (MRR), which is found by multiplying the number of merchants by the average monthly subscription fee. MRR has been growing, but monthly subscription revenue per merchant (identified in the preceding chart as MRR/merchant) has been relatively flat. While I would expect Shopify to be able to grow this number over time, the addition of new users with less expensive plans is offsetting the merchants who are moving to higher-priced plans. When merchants are paying more per month in subscriptions, Shopify can have more money drop to the bottom line of the income statement. That's a number I'll watch closely for trends up or down. As more merchants come on to the Shopify platform, the company can scale costs, and investors should expect the company at some point to become profitable. 4. Is Shopify still on track to be non-GAAP profitable in Q4 2017? Shopify has laid out a plan to become profitable on an adjusted basis by the fourth quarter of this year and reconfirmed that timing in the last quarterly earnings call. I'll be listening to the Q1 conference call to hear if Shopify executives reconfirm that they're on track to meet this goal. As I wrote about in this article, the underlying business categories (subscription solutions and merchant solutions) are stable and have healthy, predictable gross margins. Since these segments produce reliable margins, it should be easy for management to set spending targets that will ensure the company meets the Q4 goal. If management indicates a status other than "on track," I'll be concerned about their ability to manage costs or to live up to their commitments, neither of which would be a good thing. 5. Is Shopify continuing to invest? Our to-do list for 2017 is even longer than that. Luckily, they have twice as many people working on the platform as we had last year. So expect great new releases of ours all across the year, which will help make merchants more successful, which is really what this company is all about. I'll be looking for management to discuss its progress on making improvements to its platform. Shopify has set high expectations for investors by attracting merchants, declaring a path to profitability, investing heavily in growth, and achieving high revenue growth. I'll be watching to see whether Shopify can deliver on the fundamentals that have gotten the company to where it is today.